Fairtrade. Organic. Coffee on a mission. Plastic free. Strong - 6. Climate Neutral Company - First Climate Certified. 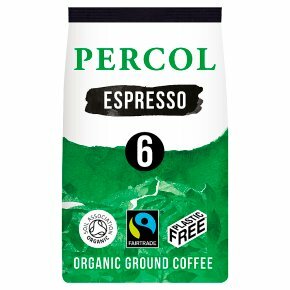 Origin: Central American and Indian Roast: Dark Roast Taste: Dark Chocolate and Spice Grind: Freshly Ground for Cafetière and Filter Coffee This coffee is organic, picked by hand, and freshly roasted in the UK. When you care, you do it properly.